WhatsApp officially launched his latest WhatsApp Video calling feature on his latest update. This feature is rolled out to all Android phone, iPhone, Windows users. After updating your phone with latest WhatsApp version you will get WhatsApp Video calling feature on your phone. WhatsApp launched his latest WhatsApp Video Calling feature for his users around the world. Why are you waiting guys do hurry and updated your WhatsApp and use “Video calling” feature on your phone. After update his phone with latest WhatsApp version all excited WhatsApp users can take benefit of video calling feature on his phone. After a long interval WhatsApp introduced his latest WhatsApp Video Calling feature for billion mobile phone users. Till date WhatsApp users can use voice call facility in his phone. But now, you can also get video calling facility on your phone. After update your WhatsApp with latest version you can use both voice and video calling feature on WhatsApp. 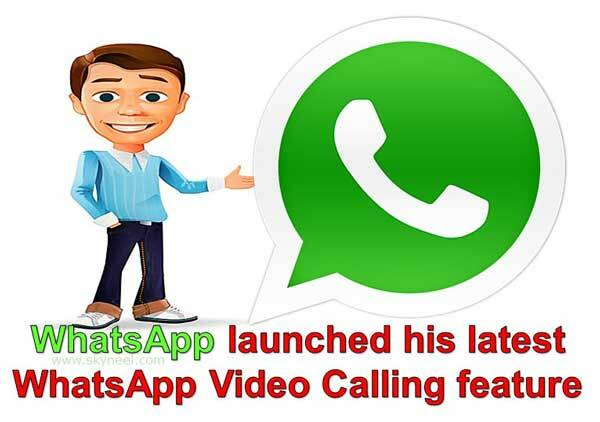 WhatsApp launched his latest WhatsApp Video Calling feature which is available in the Beta version. After update your WhatsApp you will be able to easily use video calling feature on your phone. But you can also remember if someone does not update his WhatsApp then you are not able to use video calling feature on that number. To use this feature, sender and receiver both has to update WhatsApp with latest version then after use this feature. You can easily download or update WhatsApp latest version from Google Play Store. Step 1: Download or install or update WhatsApp latest version from Google Play Store. Step 2: Tap on the “My Apps and Games” option from Google Play Store. Tap on the “Update All” button to update all the apps on you can also update beta version of latest WhatsApp as per your requirement. Step 3: After finish the updation process open the “WhatsApp” and tap on particular friend or family member to which you want to start video call. Step 4: Tap on the Call button in your friend or family member WhatsApp window and choose “Video call” option to start video calling process. When you tap on the video call button your phone front camera will be open and your video call will be started. Note: Before starting WhatsApp video calling latest feature you must have to remember that both members should be running a latest beta version of WhatsApp which supports the video calling feature. If receiver does not have updated WhatsApp beta version that your video call does not connected. I hope this guide is useful for all those WhatsApp users who want to use video calling feature from his WhatsApp to other person. WhatsApp launched his latest WhatsApp Video Calling feature for his users. Now after reading this guide you can understand how to use WhatsApp video calling feature on your phone. If you have any query regarding this guide then please write us in the comment box. Thanks to all.